Affiliations: Bartlett, Frederick Dirkreich, "Dr. Gruber"
Powers/Abilities: Without armor Torg was just a jellied mass of flesh due to experiments directed by Dirkreich. While wearing the armor his whole body was protected and he possessed superhuman strength and durability. 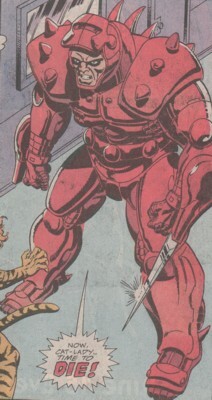 There were several weapons built into the armor's wrists like bayonets, a gas-thrower and a net-cannon. Weaknesses: He was a little bit slow in the head! History: (Marvel Super-Heroes III#2/5 (fb) - BTS) - Torg became a test subject in an experiment by Dirkreich Pharmaceutics to gain physical superiority. The experiment failed and Torg's body was turned into a jellied mass. In the process Torg got a heavy exoskeleton by Dirkreich to enable him normal movement. (Marvel Super-Heroes III#2/5) - When Tigra entered the Dirkreich Pharmaceutics complex, Torg was sent out by his boss to capture Tigra. He changed to lethal tactics when she didn't surrender and Dirkreich had to tell him over the house radio not to kill her. His first attacked missed and he put on his mask to follow Tigra through the complex. When she was trapped in a storage room he used a net to catch. She ripped the net apart and Dirkreich told Torg to knock her out with gas. Torg followed Dirkreich's order and it worked. Torg then brought Tigra to Dirkreich and his doctor. Days later Tigra was able to free herself again and Torg entered the laboratory to kill her, but she knocked Torg out with a quick, flying kick to the head. It is unknown if Torg's mental problem was caused by the experiment or if he was like that before. The latter one wouldn't surprise me as Dirkreich was IMHO capable of using a mentally handicapped as test subject for his experiments. At the end of the story Tigra brought the stabilizer created for Dirkreich to the hospital where her father was and the doctor's were able to save Mr. Grant. (Marvel Super-Heroes III#2/5 (fb) - BTS) - Bartlett became a test subject in an experiment by Dirkreich Pharmaceutics and was turned into a hulking, mindless automaton. 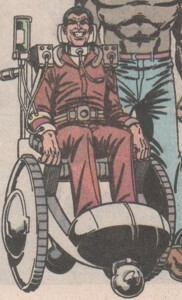 (Marvel Super-Heroes III#2/5) - The manservant Bartlett pushed Dirkreich around in his wheelchair and stayed at his side. After Dirkreich and his doctor gave Tigra a few explanations Bartlett left the room with Dirkreich again. (Marvel Super-Heroes III#2/5 (fb) - BTS) - Frederick Dirkreich was the extremely rich chief executive officer of Dirkreich Pharmaceutics. He bought a company (that employed Tigra's father) and used it for his illegal business including extortion and drugs. He tested a genetic virus on himself to break down his cellular structure and reshape himself into a superior being, but the experiment failed. Dirkreich's cells didn't stop to degenerate and Dirkreich was soon bound to a wheelchair and life-support systems. 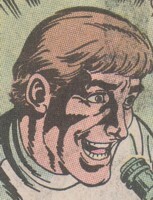 In a plan to lure Mr. Grant's daughter, the heroine Tigra to Dirkreich Pharmaceutics, Frederick invited all the employees that planned to tell the police about the company's illegal activities, to a dinner and infected them with a more potent version of the virus, which threatened his own life. (Marvel Super-Heroes III#2/5) - Tigra found Dirkreich's card in her father's drawer and went to the company's HQ where she was already awaited by Dirkreich and his lackeys. 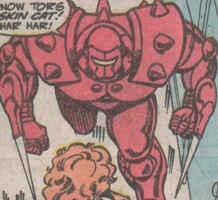 Dirkreich sent Torg after Tigra and helped him with useful instructions to defeat her. When she awakened again Dirkreich was brought into the lab by Bartlett and he revealed that the death of his former employees was part of a plan to lure Tigra to him. He told her about the failed experiment on himself and that he needed her DNA to stabilize the virus. Days later Dirkreich's doctor had the stabilizer finished and was ready to inject it to Frederick, but Tigra had escaped her shackles and stopped the injection. She took the stabilizer with her and left Dirkreich behind to die. 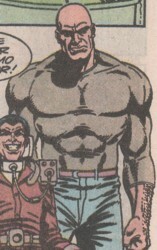 (Marvel Super-Heroes III#2/5) - He was a loyal employee of Frederick Dirkreich. He helped him to gain his dream of physical superiority as good as he could. He overlooked the capture of Tigra and began to test her DNA as soon as she was caught and secured. He found out that Tigra really had what Dirkreich needed for a stabilizing agent and after telling her together with Dirkreich about their past failures the doctor revealed to Tigra that her father would need the stabilizing agent he wanted to create from her genetically altered DNA. After days of work the doctor's work was finally successful. He brought the vaccine to Dirkreich and was ready to inject it to him, but Tigra was able to free herself and knocked the doctor out before he could do it. Tigra took the stabilizer from him and left after a short struggle with Torg.